frank posted Answer by futtta for Intrusion Detection System for WordPress sites. frank posted Understanding the Open Graph Protocol. frank posted Mike Hanson, Douglas Crockford, and Facebook; A tale of security, privacy, and performance. frank liked Rogue Wave – Lake Michigan. frank posted Automatic App Updating Coming in Android 2.2.
frank published High performance YouTube embeds. frank posted Aves: HTML5 Game Engine w/ Social Built In. frank posted SVG updates in upcoming browsers. frank posted Google’s Android Fragmentation Problem Persists: AdMob. frank posted Telling robots about your crawl-able Ajax apps. frank posted Firefox for Android Pre-Alpha Released. frank posted Android overtakes iPhone: more traffic in U.S.. This entry was posted in web wandering on 28 April 2010 by frank. frank posted HTC Considering Its Own Phone OS. frank posted Comment by futtta on possible to shrink contents of iframe?. frank posted Answer by futtta for Difference between Chrome and Firefox addons ? (Developers Point of view). frank posted Answer by futtta for What is the best way to optimize an iframe content in webpage for search engines. frank posted Opera Mini Rules Apple’s App Store. frank posted Comment by futtta on WordPress to Static .html solution. frank published Firefox Lorentz: Flash don’t crash here anymore. frank posted Gmail Adds Drag-and-Drop to File Attachments. frank posted Drag and drop file uploads in Gmail using just the specs. frank posted Answer by futtta for Can a WordPress blog pull content from Django pages?. frank posted The Best HTML5 Slides Ever. frank posted The Best of Steve: Performance at JSConf. frank posted Answer by futtta for Web GUI frameworks for Phone development. frank posted Web Design: The Decline of the Homepage. frank posted Oracle free software reality check. frank posted Answer by futtta for What is the best minifying plugin or tool for wordpress based sites. frank posted Comment by futtta on iFrame isolation. frank posted Firefox 3.6.4 beta available for download and testing. frank posted Comment by futtta on Intrusion Detection System for WordPress sites. This entry was posted in web wandering on 21 April 2010 by frank. A couple of days ago I installed Lorentz, a beta version of Firefox. Lorentz is virtually identical to Firefox 3.6.3, except that it incorporates part of the work of the Electrolysis team. Their “Out-of-process plugins”-code lets Firefox-plugins (on Windows & Linux, they’re still working on Mac OSX according to the release notes) run in a separate process from the browser, meaning Flash (but also Silverlight or Quicktime) can’t crash Firefox any more. This feature actually is long overdue, a substantial amount of Firefox crashes are indeed caused by Flash failing and Mozilla’s competitors (MS IE, Apple Safari and Google Chrome) already have similar (or even more exhaustive) crash-protection. Once you’ve installed Lorentz (or Chrome or IE8 or Safari off course) you can safely visit http://flashcrash.dempsky.org/, which exploits a bug that was reported 19 months ago and which may still cause the most recent Flash-version (10.0.45.2) to crash. 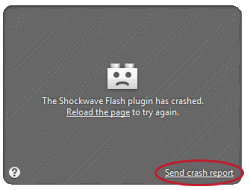 And if flashcrash doesn’t bring up the plugin-crash-dialog, you can always kill the “mozilla-runtime” process that hosts the plugins, just for kicks! This entry was posted in browsers, firefox, lang:en and tagged firefox crash, flash, lorentz, plugins on 15 April 2010 by frank. frank posted Mozilla Web Caching Summit. frank posted AdLib: PastryKit for the tablet?. frank posted Mozilla Contacts makes Firefox socially aware. frank posted Everything you need to know about iPhone OS 4.0.
frank posted The Apple-Adobe War Escalates: Using Flash to Build iPhone Apps Banned. frank posted WebKit 2: Baking split process model into the renderer. frank published No more jsonp for Google geocoding webservice?. frank posted Google adds site speed to search ranking. frank posted Adobe Employee: Go Screw Yourself, Apple. frank posted Answer by futtta for Inter Widget Communication for iGoogle like portals. frank posted Palm take-over watch. frank Frank heeft een koppig vliegende kip nog maar eens gekortwiekt. luisteren zal ze!. frank posted Answer by futtta for Is there a size limit for HTML5 Manifest?. frank posted Answer by futtta for reverse geocode a set of co-ordinates. frank posted Answer by futtta for Where can I find a definitive reference on HTML 5 database SQL syntax support?. frank posted Palm is For Sale. frank posted Comment by futtta on iframe accessing parent DOM?. frank posted Rumour: HTC Might Buy Palm to Fight Apple?. frank posted Comment by futtta on reverse geocode a set of co-ordinates. frank posted Hell Has Frozen Over: Opera Mini Coming to the iPhone. frank posted Report: Google Will Release VP8 Video Codec Under an Open Source License. frank published Why I’m rooting for HTC to buy Palm. frank posted Answer by futtta for How to not cache a php file where a cachemanifest is beeing called?. frank posted Comment by futtta on How to not cache a php file where a cachemanifest is beeing called?. frank liked Rufus Wainwright – Oh What a World. frank posted Answer by futtta for possible to shrink contents of iframe?. frank posted XMLHttpRequest Priority Proposal. This entry was posted in web wandering on 14 April 2010 by frank. Apperantly Lenevo, Huawai and ZTE have expressed interest, but I for one am especially rooting for HTC. They do great hardware (e.g. my old Qtek 9100, my current HTC Hero and Google’ Nexus One) and they have exprience with a multi-OS product line (Windows Mobile and Android). But most importantly; they have Sense UI! Sense is the user interface that HTC puts on top of WinMo and Android, to provide users with good looking, easy to use home screens that feature widgets to display e.g. calender, mail, clock, weather, but also information from Facebook, Twitter and Flickr. WebOS could really help HTC broaden and deepen Sense; e.g. by porting the WebOS multitasking cards metaphor, Synergy (unified contact list, deeply integrating internal sources and social web) and the nifty notification system. And Mojo could (easily?) be ported to WinMo and Android as well, HTC could then open up Palm’s App Catalog for all HTC WebOS/Sense devices, allowing developers to create, publish and sell mobile applications for multiple operating systems! Picture all of that and all of a sudden you’ll see a major player that has the hard- and software and the experience to challenge Apple at home and abroad and in court with great hardware and, thanks to WebOS, even greater software. Go HTC! This entry was posted in android, lang:en, mobile web, rants & raves and tagged htc, mojo, palm pre, sense, webos on 13 April 2010 by frank.